In a certain sense, it’s taken me 15 years to write this review, because I’ve waited 15 years to eat at The French Laundry. When I was a poor college student, I would comb Chowhound’s San Francisco messageboard for tips about good, affordable restaurants. In those pre-Yelp Dark Ages, the board was even more bare-bones than it is now, and nearly impossible to navigate or search. Yet it was still clear that the holy grail of dining experiences was not to be found in San Francisco proper, but rather in a city to its northeast. Yountville, California – that’s where my Mecca was located – The French Laundry. Over the course of the last 15 years or so, I’ve had various opportunities to go to The French Laundry — some real, and some simply hoped-for — but none really materialized. My sweet grad-school boyfriend promised me a trip as a graduation present, but I was never able to secure a reservation – at least, not before the relationship ended. (Darn.) My FRIEND’S ex-boyfriend, a business guy, told us he would take us “when his fund closed,” whatever that meant. In the subsequent years, my friend always laughed it off when I asked her how the ex’s “fund” was doing, and I laughed, too – only half-joking. Along the way, I saved up enough to treat myself to a meal there — but it never seemed to be the right time and reservations always seemed impossible to come by. Fast-forward to 2015. I sat in front of my monitor, staring dumbfounded at the Opentable page for The French Laundry. The restaurant had just reopened reservations that morning after months of repair due to renovations, and on a whim, I checked to see if there were any available reservations. I was astonished that in front of me were a whole bunch of dinner times that were still open. Should I get a table? I quickly rallied together a group of four, we checked our respective bank accounts (and winced), and reserved a table for a Sunday. Book first and worry about my lack of funds later – that’s my motto. Would The French Laundry live up to its exalted reputation? I wasn’t so sure. The food world has changed in so many exciting ways in the past 15 years since I first dreamed of going to The French Laundry. We now have artisanal tacos, artisanal ice cream, artisanal coffee, and artisanal pickled plums. Sous vide cooking, which Thomas Keller helped popularize, has now become commonplace in many hipster homes. We’ve become savvier eaters and food shoppers, and sometimes we even know the names of the chickens we eat. In the weeks leading up to our French Laundry dinner, I wondered – would the meal be just as innovative and relevant as it was in, say, 2000? Was I a huge jerk for even questioning Thomas Keller’s talents? Was the thirty-something me too jaded for my college student dreams? TL;DR: The meal was delicious at moments, but ultimately surprisingly uneven in flavor – and just did not have the spark of innovation that I expected from The French Laundry. The service, while perfectly capable, also lacked the charm and warmth I expected from a restaurant that was previously considered the best restaurant in the world. All of the joy was provided by our sommelier, who provided a creative and thoughtfully-designed menu of non-alcoholic pairings for our table of four teetotalers. The following is a slideshow of photos from our dinner. Oysters and Pearls: J. called it “fancy clam chowder.” I called it “clam chowder boba.” Funkily briny and creamy, and punctuated with meltingly-soft caviar, this was probably my favorite dish. Hawaiian Hearts of Peach Palm Salad: “Bafflingly bad,” I wrote down at the time. This dish consisted of disparate ingredients that seemed to have little to unify them. Slow Cooked Wild King Salmon: This tasted of salty essence of salmon, with an interesting texture of baked sweet potato. Devil’s Gulch Ranch Rabbit “Porchetta”: A rabbit roulade served with a bright pea puree, this was surprisingly standard, safe fare. In my notes from the dinner, I wrote, “Didn’t taste particularly interesting beyond the usual rabbit.” For whatever that’s worth. Charcoal Grilled Japanese Wagyu (supplemental cost): The steak was so well-marbled that biting into it was like biting into a firm pudding of fat interlaced with meat. The sauce was savory and rich, reminding me of a short rib sauce, and it was very dominating – I think with a cut of meat that costs the earth like Japanese wagyu does, I want as few ingredients to be added to it as possible, so as to allow the meat to shine. Honestly, I was disappointed by our meal. But on the bright side, this experience made me think more critically about where and why I enjoy dining out. At the end of the day, what are we paying for when we decide to save up our money for a trip to The French Laundry? Are we paying for quality ingredients and impeccable technique? Are we paying for an experience of luxury, and if so, what does that luxury look like, in terms of food and service? I think what we’re paying for when we go to a three-star Michelin restaurant is not merely deliciousness (and, to be clear, this experience was far from flawlessly delicious). This may sound whimsical (a nod to the wide-eyed dreaminess of my college days), but I think we’re looking for the experience to delight us, to bring us joy, to be, ultimately…magical. This is the kind of experience that should make us smile with a faraway look in our eyes when we think back on the meal, partly because of the circumstances (as in, we chose this restaurant for a blowout, once-in-a-lifetime visit), but also because of the theater and immersive quality of the whole experience. Magic was what I’ve been able to experience at Le Cinq, Meadowood, Alinea, and Chez Panisse. Magic is not what I encountered at The French Laundry. We signed our credit card bills and were escorted out the door with friendly smiles, and as the last one of our group stepped over the threshold, an employee inside the restaurant yelled, “Let’s close up!” And that, to me, summed up our whole French Laundry experience: reasonably tasty, ingredients of impeccable provenance, and friendly, albeit in a distant and primarily transactional way. Although I had not entirely loved my experience at the restaurant, I was thoroughly delighted by our parting gift: the restaurant presented each of us with a small brushed silver tin of rectangular shortbread cookies. Dusted with granulated sugar and baked to a deep golden brown, the cookies were charmingly austere and a good accompaniment to tea the next day. Something about the thickness of the dense, buttery cookie and its oblong shape felt particularly satisfying as I held the cookie between my fingers, nibbling away at it and savoring its butteriness. 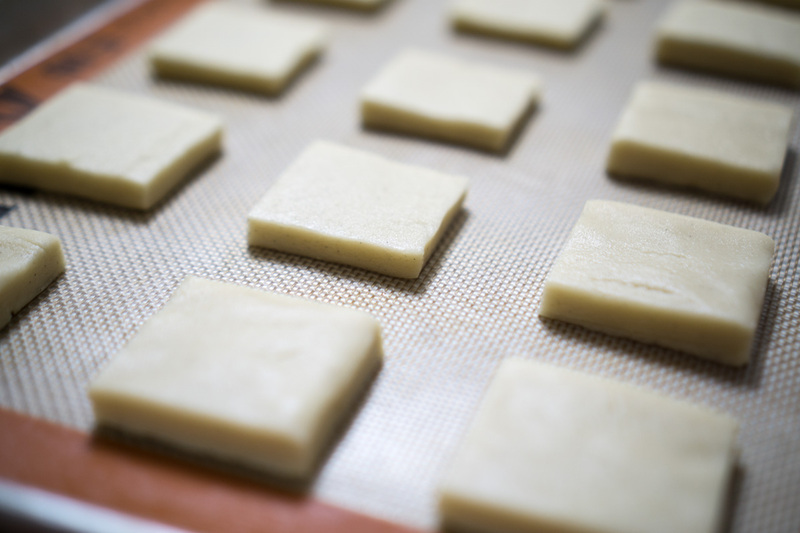 After doing some poking around on the Internet, I was able to find a recipe that claimed to be The French Laundry’s shortbread recipe! I tweaked it a bit to suit my tastes. I have strong feelings on shortbread: I don’t like vanilla in my shortbread because I think it detracts from the butter, yet I was reluctant to tinker too much with the original pastry chef’s vision, so I simply reduced the whole vanilla pod to one teaspoon of vanilla paste. 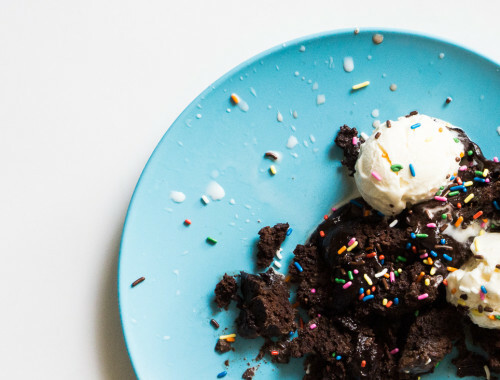 (You may also substitute vanilla extract, if you’d like, or eliminate the vanilla altogether, which would also likely yield a delicious cookie.) I added a bit of salt to further bring out the flavor of the butter. 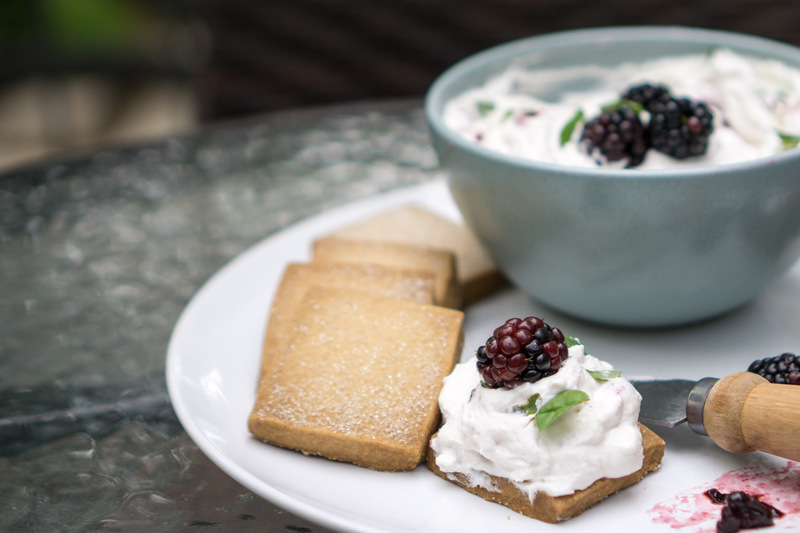 For a lovely and more elaborate afternoon snack, I decided to pair the cookie with cream, whipped to soft peaks with powdered sugar, streaked through with crushed blackberries and sprinkled with basil. 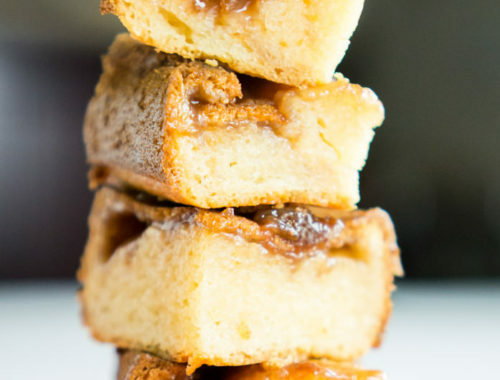 You can serve this as a lovely rustic dessert as well. So, although The French Laundry of 2015 did not live up to my dreams from 2000, I’m not feeling sorry for the college me: I’m happy to know that I live in an exciting time where the next magical food experience is likely to be just around the corner…and in the meantime, you’ll find me sitting in the corner, happily munching on its shortbread cookies. Preheat the oven to 350 °F. Sift the flour into a large mixing bowl and add the superfine sugar and salt. Add the vanilla paste (or extract, if using) to the bowl along with the butter. Using your fingertips, rub the butter into the dry ingredients. 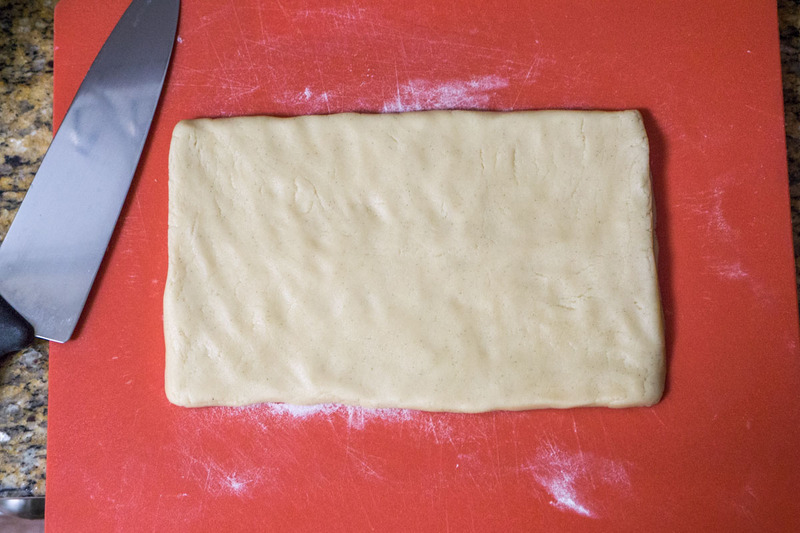 As the mixture begins to come together, use your hand to help it form a dough (alternatively, you could use an electric mixer with the paddle attachment on a low speed to make the dough). 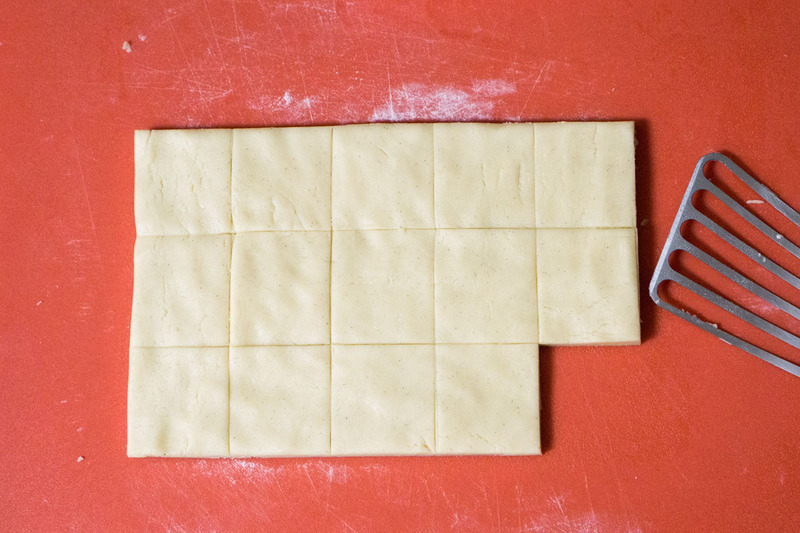 Shape the dough into a ball and flatten it slightly. Roll out on a lightly floured surface to about 1 cm/1/2 inch thick. Cut into 15 oblongs. Lift them with a thin spatula (a wide offset spatula or even a thin fish turner would work nicely here). 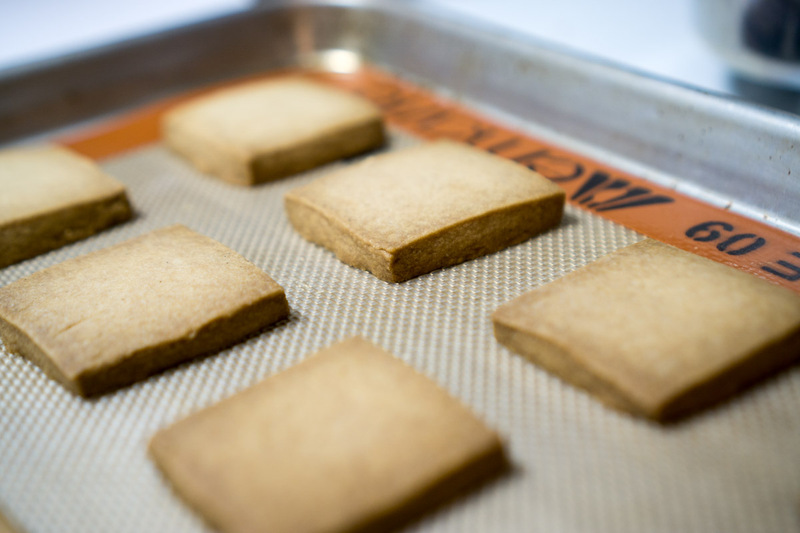 Place them on a baking sheet lined with baking parchment. Bake for 15 minutes, then turn the baking sheet around and continue baking for 10 minutes, until the shortbread is golden brown. Remove from the oven and dust with an even coating of granulated sugar. Leave on the baking sheet to cool. Beat the heavy cream with a hand mixer or standing mixer. Halfway through the whipping process, add 1-2 tbsp. of confectioner's sugar, to taste. Continue whipping until you get soft or stiff peaks, as you prefer. Add about 3 crushed blackberries and 3 leaves basil, torn into small pieces, and swirl through the cream. 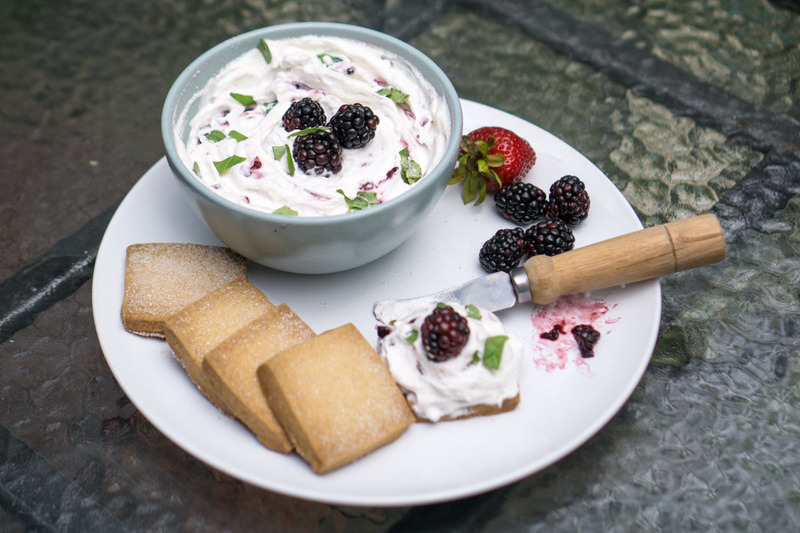 Pour cream mixture into a pretty bowl and top with extra whole blackberries and torn basil leaves. 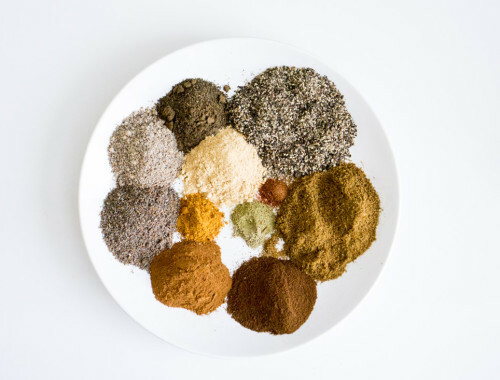 Tip: You can make superfine sugar in a blender or food processor - zap it anywhere from 30 seconds to 1.5 minutes and make sure to put a little more sugar than is called for in the recipe to account for loss of product while blending. Weigh the sugar - I cannot emphasize that enough.